Ever wanted to hold the whole world in your hands? Why not several? 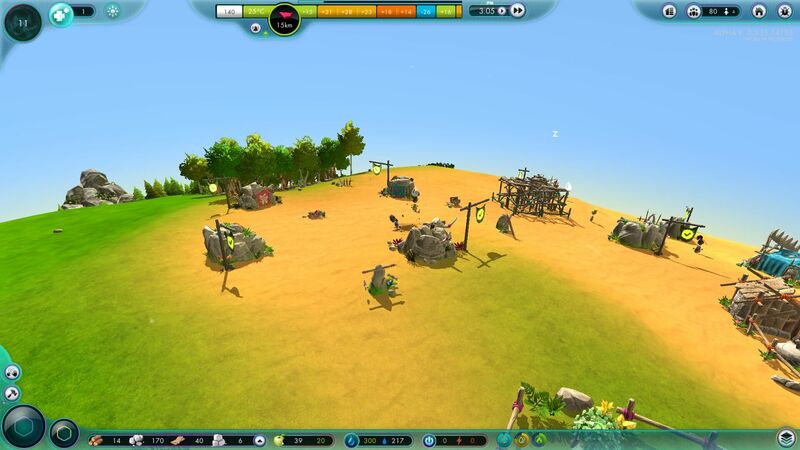 The Universim goes a step beyond other god simulations by offering an entire universe to shape to your liking. 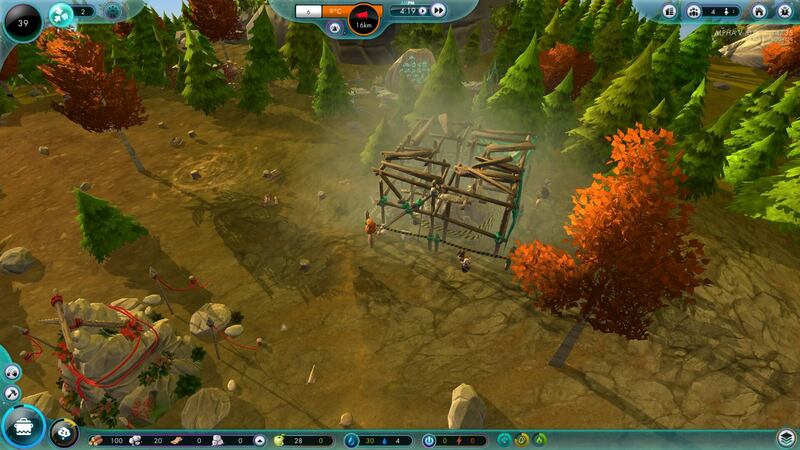 But less-ambitious god sims have turned out to be bug-ridden busts before, so where does The Universim fit in? 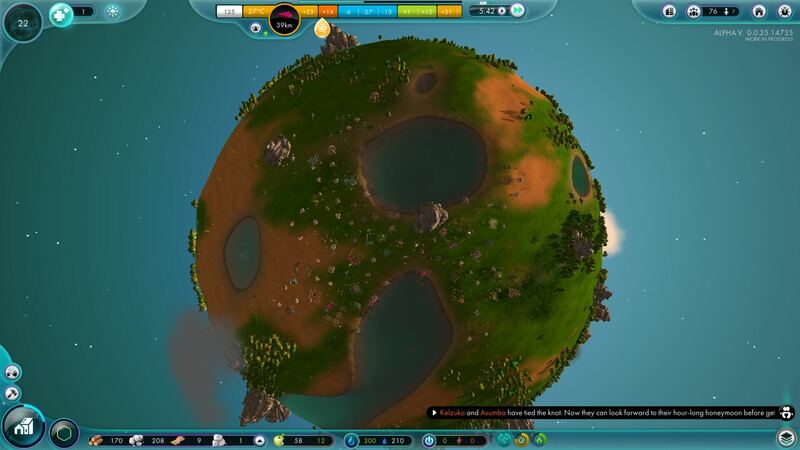 The major difference between The Universim and others in its genre is that it grants control over not one, but several planets. This begins with one mother planet then, as your civilisation expands its horizons, spreads out into space. It takes a while to get there, though — reaching the next era of civilisation takes a few hours of building, research and resource juggling — so most of our time was spent on the starting planet. Your world, taken in context of the size of its people, is more of an asteroid in dimensions. Covered by clusters of trees and mountains, its lakes harbour whales and its plains play host to a handful of wandering creatures. Its diminutive size lets you focus on the people upon it as they cover its surface, rather than losing them amidst the detail. One of the things The Universim attempts to do is keep you attached to your subjects’ lives. It may not be big, but it’s home. As a god, though, what do you control? Every game has a different perspective. In The Universim, the main course of forward momentum comes from building placement, which you are directly responsible for. The hub of this is the Evolution Tower — the first building you place and the driving force behind your civilisation. It lets you choose new items to research at regular intervals, picking from a selection of boosts and upgrades. These take several minutes to complete, but you can queue the low-tier upgrades and are (currently) guaranteed to research all of them eventually. Once the tower is down, your nuggets spawn. These are your worshippers, your workers and your playthings. Without them, you’d be nothing. Nuggets have lives of their own, building houses, eating, drinking, dating and reproducing (in a Sims-style, rock-the-bed fashion) under your watchful gaze. Nuggets rhyme with rabbits… and reproduce with about the same frequency. Their autonomous building can be an issue at times, as houses still cost resources to build and tend to get prioritised over every other building regardless of divine intervention. In our first playthrough the nuggets taunted us by building across the other side of a lake and subsequently being too far away to date each other (a bug that has mercifully been fixed since). Most of the time, though, you’re free to prioritise your own building plans. Building stuff is a balancing act between producing enough resources to maintain your current population and not having so many buildings in construction (or upgrade) that the work gets spread too thin. First, though, you have to build the Archive — and you really have to, as the archive is the only way you can save your game. It’s a little odd at first, but as it’s one of the first things you build, it’s not too much a problem. No, your major concerns here are with water, food, maintenance, happiness and, later on, resource gathering and refinement. A feature of autonomous building I really like is the way nuggets position their houses in little huddles. Along with the automatic formation of paths between buildings, this is a nice touch to add to the lived-in feel of your world. Nuggets need water to live, so each building has a water requirement. You meet these by building pumps around the edge of lakes — but be wary, because this resource is finite and doesn’t appear to replenish over time. The same is true of fish, which are caught by assigning nuggets to work at a fishing dock. Doubtless this is a problem to face late-game on a planet, prompting a rush to space (in lieu of sustainable fisheries, we assume). The biggest problem comes a few hours into the game, just when you’re ready to advance to the mediaeval age but are still in the process of upgrading your buildings. For these constructions, you need refined wood and stone — and rather a lot of it. With so many buildings on the map to upgrade and so many new ones to build, getting these refined resources as fast as possible is a major cause for concern. It seemingly takes forever and while you wait, you can’t do much. This is an area which could probably do with some balancing before release — perhaps by increasing gather rates, as forests don’t seem to regrow over time. Engineers are so important that we built ours before we even built any food-production buildings. So, god powers. While at first they may seem exciting and important, they’re not, really, apart from one power. This is Rejuvenation, which you cast on a nugget or building using Ctrl + LMB, healing until they reach full health or you run out of power points, whichever comes first. Unfortunately, points accumulate incredibly slowly. While apparently based upon how much your nuggets worship you, they never seem to accumulate faster as you perform kind actions. You can carry out missions for your nuggets for points, but as yet the missions end after receiving two. Considering how much manual repair work you have to do, you never have enough points for more interesting skills, like summoning rain clouds, making nuggets happy (which is very expensive) and unleashing tornados. Still, at least fire is cheap, right? We did get to use the Cupid power a few times when the long-distance relationship bug was still a thing, though with no tooltips over nuggets we accidentally selected two women, which while nice for them, didn’t exactly fix our diminishing population. No doubt this is a feature to be refined come release, so hopefully points become easier to accumulate and wrathful powers gain a purpose. After all, why send something to destroy the buildings you spent so long waiting to be built? If there were some obvious benefit to the player to weigh against the morality of killing subjects, those powers might see some use. Tornados, of course, are usually considered natural disasters — and nature does indeed spawn them, amongst other events. You get advance notice of these and can alert your nuggets to hide in bunkers, but storms don’t always travel over your people and if they do, there’s nothing you can do to stop them. Thankfully, they never did much to us, so disastrous disasters may be quite rare until the late game. The Universim has, according to its patch notes, got a lot of content within it. We have to say that it takes a while to get to the really interesting stuff at the moment. While spending time on a game isn’t a bad thing, the ratio of entertainment to time spent seems a little off at the moment. This is perhaps due to the micromanagement of repair, which if negated somewhat could let you speed up time a bit more through the periods when you’re waiting for resources. Thankfully, the tornado we saw petered out before reaching our civilisation. We’re interested to see what the final product has in store, especially when it comes to the recent promise of exile villages — societies of wronged subjects growing alongside your core base of followers. With incentive to wrath and trade alike, the consequences of their presence will make for interesting play. 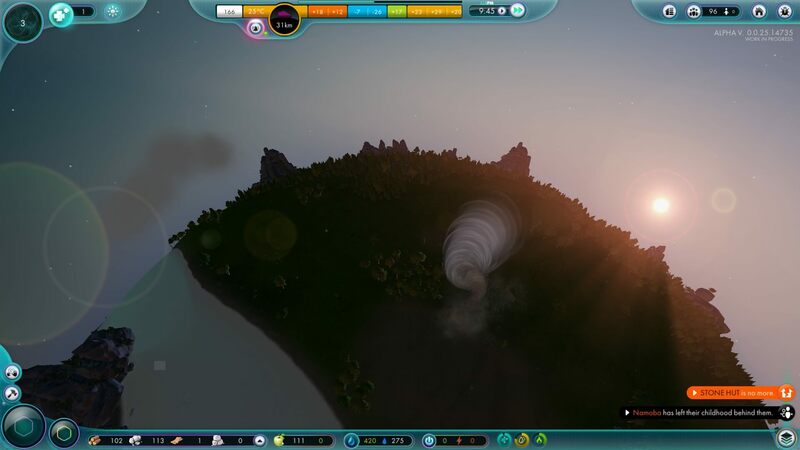 The Universim is hurtling towards the finish line at the moment. Successfully funded back in 2014 via Kickstarter, it now only has until the end of August to be ready for ‘pre-release’ after a period of early access. Created by Crytivo — the same studio behind Goblins of Elderstone — The Universim does come with a little bit of background grumbling about the length of development. 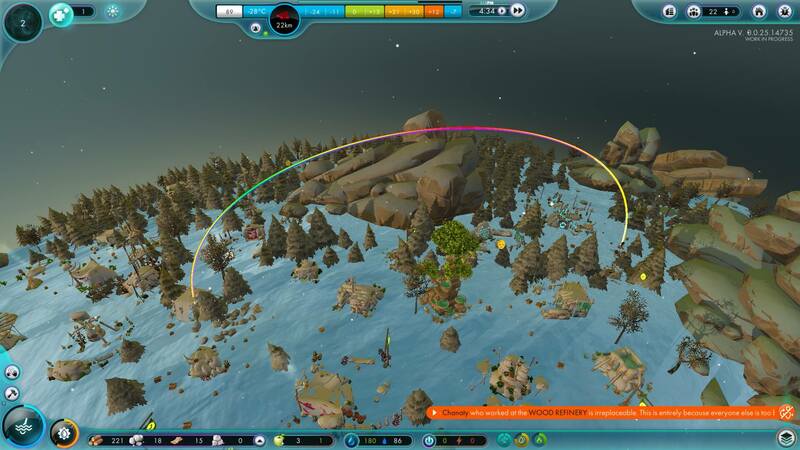 But we’re interested in the here and now and to us, The Universim appears to have become something worthwhile.